How many times have you caught yourself saying “I didn’t know that shop even existed”? Now imagine the number of times others have said the same for your business. Owing to the insane growth and rapid introduction of new businesses in the market, it becomes pretty easy for bland and boring shops to go unnoticed and lose sales. In order to place their shop or office in a more promotionally strategic position, more and more businesses are now opting for window graphics that advertise their brand in a much more cost-effective way. 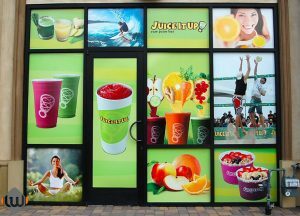 Here we will be looking at the top ­4 advantages that come from using window wraps for businesses. Window graphics are a considerably cost-effective way of grabbing the attention of potential customers and turning them into actual buyers. Window wraps allow you to experiment with your creativity and offer you the freedom to display who you really are, what your business stands for, and what you sell, thus offering word-of-mouth promotion about your business within your community. Did you know that the traditional means of advertising (putting up a sign, a banner or a sidewalk sign) sometimes restricts you in terms of the ad’s size and requires you to buy a permit? And failure to oblige can bring along heavy fines? On the other hand, window wraps come with no such regulations, which means taking advantage of this can save you a great deal of time, effort and money. Your business name should always remain at the top of your customers’ minds, which is why it is important that you advertise it in strategic positions and prominent places. An eye-catching window wrap is a great promotional option that will instantly captivate attention, direct them to your store and help your business improve brand awareness. With the help of window graphics, you can also advertise any promotions and special offers that will get potential customers interested in what you have to offer. Window wraps can greatly heighten an onlooker’s curiosity. If a potential customer is intrigued by you window art, but cannot see right into your shop, they might perhaps go the extra mile and actually walk into your store to see what you have to offer, eventually becoming a loyal customer.